Comments on "On The Street.........Stockholm, Sweden"
Great shot, Sart. I really like this look -- apart from the shoes! Why would someone ruin such a classic outfit by adding those white shoes? This type of shoe ("sneakers," "trainers") should only be worn in the gym. It's as if this guy suddenly forgot how to dress when he got to this feet. Sloppy. He is wearing a wonderful jacket though. but what I want to know most of all is where is the missing child??? I think that is Joel Persson, AD on Café Magazine. please. he looks great compared to every other person i've ever seen pushing a double stroller, myself definetely included! lay off the shoes! Well, don't you think the baby's blanket was a little too yellow? With insufficient hem showing? And where's its pocket square? Love the guy and baby! I just wonder if there is supposed to be another child since the man is using a double stroller? Love the look. I think the shoes are okay because of his age. If my grandpa wore that with those shoes, I'd ask him why, but not this dude! Maybe you're of grandpa agedness, laguna...? I love the Edward Goreyness of badminton shoes(classic and classy) with tweed...if only he were wearing a full length bearskin coat (sigh). Lay off laguna beach rigid, it would have been 3 striped windpants and a hoodie with every other strolling dad. Celebrate him, don't hate him. I think he looks like Swedish designer of furniture Anders J.
I'm not going to back down on this one. Wearing sneakers with such beautiful clothes is inexcusable, IMO. He's obviously a stylish guy and has taken care to pick out a beautiful tweed jacket, shirt, khakis, and bowtie, so why did he stop at footwear? Does anyone know if this guy is American? If not, I'm sad to see the ultra-casual American look has even infected Swedish guys who should know better. Aside from his shoes I really LOVE his look. And I HATE HATE HATE that stroller. Typical parent who takes up the entire sidewalk. Thanks for shoving me into the gutter. Love the nerdy chic look! Perfectly sartorial but not too polished or trying too hard. IMHO tasteful white canvas sneakers are part of the gentleman's wardrobe and can be appropriate with odd jackets. what a great look -- he manages a bowtie without looking like he's a) wearing a period costume or b) a member of the nation of islam. also, how many self-styled 'gentlemen' are there trolling the internet waiting to pillory anyone who breaks the rules of tailored clothing? i can't imagine ever caring if someone buttons the 'wrong' button or wears 'incorrect' shoes. if it looks good, what's the problem? he's wearing clothes, not a uniform. he looks like a cool professor taking his child out on the weekend. love it. funny, butch. i like it. and i acutally really like the color story of this whole photo, especially that yellow. i feel compelled to chime in on this one. at the start of every summer, one of the first things i do is by at least 2 new pairs of low cut chuck taylors, one natural canvas and the other navy blue. and i wear them with absolutely everything shy of a business suit or tuxedo. frequently with ties and sportcoats. i NEVER wear them in a gym. they make it easier to dress stylishly and still spend the whole day working on your feet or ride a bike or walk around all day with a baby, things i do all the time. i think it takes an EXTRA modicum of style not only to attempt such things, but to pull them off as well as this gent. laguna: You are taking this shoebusiness way too seriously.Firstly,I don´t think this papa is a fashion freak.To me he seems just an ordinary chap who picked something from his closet to put on going to town with his wife and kids, maybe on a weekend day.He chose sneakers cause he knew that the streets in Stockholm are partly pebblestoned and knowing it would be a rough day pushing the troller,he put comfort above all and even volunteered to carry the bag with the extra diapers.Can´t you accept this? So wasteless to make an issue of the shoes. Ladies and gentlemen! Converse /sneakers are worn with everything nowadays . The contrast with the rest of the outfit is sometimes the point - in many parts of the world. 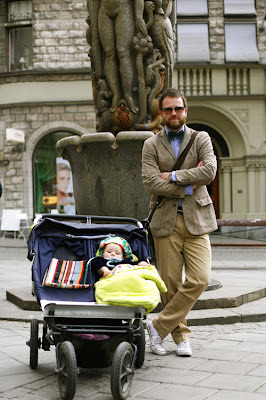 "Double strollers" are very common and popular in Sweden and not always used only for babies ! But almost always used for running down the rest of us !!!!!!!!! This dad is just resting before he attacks innocent pedestrians with his "vehicle" !!!!!!!!!!!!!!!! yay!! go stockholm :) a perfect handsome Swedish father.. love it! This guy is Swedish, and he's the Art Director for Café Magazine; the Swedish equivalence to GQ. He wears bow ties EVERY day. I like his overall look. I'll take it any day over the sloppiness I see where I live. He looks nicely dressed and yet comfortable. And if you look carefully, it seems his shoes have tan striping. And this is why I miss Stockholm. Just so you know all my friend's husbands rock paternity leave just like that..... why did I move to New York again? there are compositional elements in your images that astound me. this is more of an artistic composition than a fashion shot. Don't think you have to worry about the other child. In Sweden we have a parental insurance that makes it possible to stay home with the baby for 12-18 months. One of the parents has to take at least 30 days of from work to get maximum payment from the insurance (still it's mostly mummy that takes the rest). So my guess is that the elder child is at the nursery. The stroller is a Mountain Buggy Urban Double (in the US market) and is one of the best double strollers available. It takes up the same room as a wheelchair (It is 29" wide), so a PP's complaint about a stroller taking up the entire sidewalk is unwarranted in this instance. The fashion forward accessory of the season- a baby. Every guy simply must have one. Oh, and a wrinkled suit helps. I really stand beside this guy.. this is a classic way of dressing in sweden and it looks cool too! i just wish that it could be more appreciated in the rest of the world! Oh he is my dream-man! What a casual beard, sweet little bowtie and gorgeous layers! what a hunk! Converse, chinos and a tie, that´s just sooo cool! I am an American living in Sweden, and if anyone can give you a run for your money when it comes to style, it's a Swede. They are masters of understated cool. This man is the perfect example. And as for the Converse, they are cool, comfortable and perfectly balance the rest of his outfit!